Since 2000, when HD TV was first introduced in the market, color television evolved with better resolution every six years. In 2006, it was the full HD TV, and 4K UHD TV (with 8 million pixels) emerged in 2012. In the third quarter of last year, UHD TV market share exceeded that of full HD in the global market for the first time. UHD TV has become the mainstream in the TV market in about six years after it was first introduced in 2012. Global and regional partnerships for popularizing 4K UHD were made at a round pace. Samsung has also been concentrating their efforts to spread the UHD ecosystem by establishing the HDR 10+ Alliance with 20th Century Fox and Panasonic. This year, it isn't just 4K that will show amazing pictures to us. It will be the first year for the 8K displays to enter the market. 8K resolution reaches up to 7680×4320. Theoretically, it should be four times sharper than 4K UHD(3840 x 2160), which was commercialized by the three major terrestrial broadcasters in Korea at the time of Pyeongchang Winter Olympics. 8K has emerged in accordance with the trends of 'large screen' and 'ultra high definition' in the premium TV market. TV resolution has become very important as the size of commercial TVs grew. However, some are pointing out that more time will be needed for the 8K TV to be launched because of the lack of UHD content. These people are saying this because 8K TV has to be backed up by technology to create 8K contents. Samsung is attempting to take the lead in developing and spreading TV technology by adding artificial intelligence algorithm that automatically enhances low-resolution contents to its TVs to solve this kind of problem. Samsung revealed its '8K AI QLED TV' at the 2018 TV Global Launching Event, which was held on March 7 at New York. 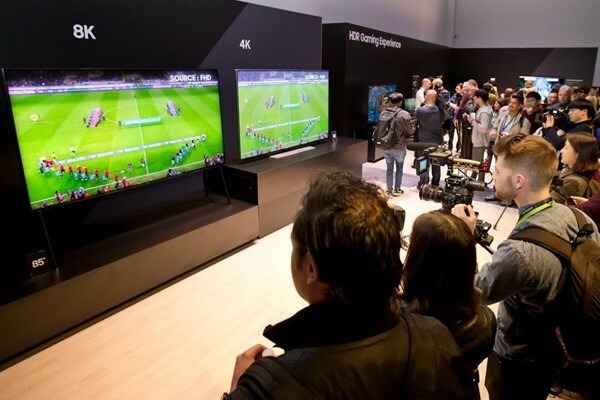 Through this event, Samsung expressed its intention of dominating the 8K TV market with its strategy involving a bigger screen and higher resolution. The TV will be gradually launched in the global market, starting from the second half of this year. Aiming to keep its number one position in the global TV market for the thirteenth consecutive year, Samsung is putting forward its advanced technology including the AI picture quality conversion and 8K picture quality. The 8K AI QLED TV that Samsung has revealed can convert low-quality images (SD) to high-resolution images (4K) and even optimize their sound. The 8K AI picture quality conversion technology that Samsung introduced for the first time in the world leverages 'machine learning' technology. Using Machine Learning Super Resolution (MSLR), the AI learns from the huge database consisted of the series of the same content in two different resolutions that are high and low. It compares numerous image contents by type and analyzes the technological features of low resolution and high-resolution images to find out the relationship between the two. Based on this function, the AI can find the optimal filter for correcting the brightness, black level, and blurred effects that can be applied to any low-resolution content, and manages to convert them into 8K high-resolution images. This technology allows Samsung 8K QLED TV to express contrast in a natural way and recreate realistic images without loss of light. It can also express what the original content creators intended in detail. The TV controls every detail and allows the viewers to see the blurry outlines of texts and the subtle light around the moon. "Because the 8K AI QLED TV can convert contents with low picture quality to high-resolution images, we can make the screen as big as we want", said a Samsung official. "Samsung will lead the trends of the TV market that is leaning toward big screens with its excellent technology, and consumers will be able to enjoy clear 8K UHD picture quality from screens of various sizes", he(she) added. The AI technology of the 8K QLED TV can not only improve picture quality but it can also optimize the sound. The AI technology allows the TV to automatically analyze content in real time after setting it up just once. It learns the characteristics of each scene and optimizes the sound, offering vivid experiences for all contents. Samsung QLED TV is highly acclaimed for its contrast, color representation, and detailed image expression, and is being reviewed as “a TV fit for 8K resolution”. In February, Samsung and Skylife teamed up and succeeded in test-broadcasting 8K UHD content at a national level, using the QLED TV. The beautiful scenery of Ulleungdo was aired through 2018 85-inch QLED TV model in 8K picture quality. This proved the possibility of a new era with ultra high definition broadcasting. 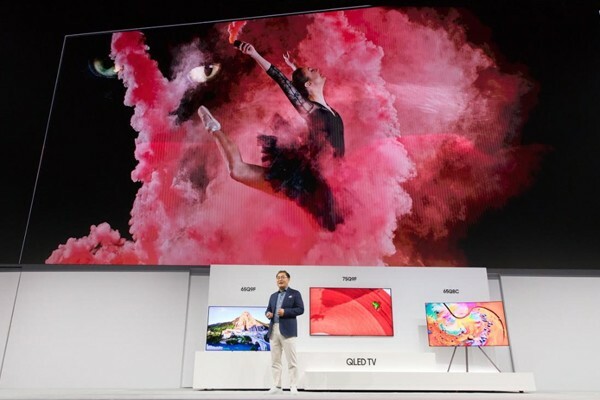 At the Global Launching Event in New York, Samsung not only announced its ambition to lead the market in the 8K TV era, but also unveiled the 2018 QLED TV line-up (Q9F, Q8F, Q7F) and the new smart features of its TVs such as ‘Bixby’ which offers more convenience to users, for the first time in the world. “By strengthening our new product line-ups including large screen TVs with displays over 75 inches and 8K TVs, and also by applying Bixby and SmartThings, we will deliver new experiences and value to the consumers”, said a Samsung official. Samsung made its two-track strategy official by showing its CES award-winning micro LED TV, ‘The Wall’. The Wall uses extremely small, micrometer-scale LEDs which makes it possible for the TV to be without the backlight and color filters. The LEDs act as the light source for this TV. It boasts higher performance than previous TVs in almost every aspect including brightness, contrast, color representation, black level, viewing angle, and energy efficiency. Due to the manufacturing method of attaching smaller LED chips to the substrate, the size and the shape of the TV can be assembled to the consumer’s taste, which makes it the first modular TV in the world. This TV meets the trends as its size can be enlarged, and it can also be made into a bezel-less TV with no bezel surrounding the display, covering the entire wall with the TV. This TV is expected to bring phenomenal changes in TV design. Another strength of the micro-LED TV is its extraordinary durability. OLED TVs are prone to water and oxygen as it uses organic material and it is not free from screen burn-in which leaves a permanent mark on the display. In comparison to the OLED TV, micro LED TVs can be used for many purposes including indoors and outdoors by using inorganic substances.